When Taro Aso, the Japanese Finance Minister, said in 2013 that elderly people should "hurry up and die", he took the mature voter somewhat by surprise. Clarifying, he explained he'd been talking in a private capacity, though I'm not completely sure this makes me feel all that much better. In his defence though, he was effectively toeing the party line which had previously pointed out that opening to mass immigration of care workers was not on the table but it would be OK to send more elderly Japanese to The Philippines instead. Japan still struggles with the concept of opening its doors to the wider world and as a result has turned its collective attention to the development of mechanical solutions to resolve the coming drought of nimble fingers. 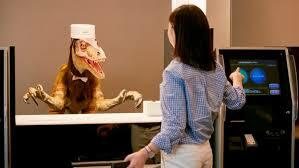 In Tokyo it's possible to check-in with a velociraptor or ask for assistance from a metallic receptionist straight from the chasms of the uncanny valley. But in contrast, a cute, semi-sentient seal brings pleasure to dementia stricken elderly without the need for psychotropic assistance. In a country where care workers genuinely care, there simply aren't enough hands to go around. So robotics is seen as a solution. One of the leading players in the development of power enhancing exoskeletons is Cyberdyne Inc with the HAL 5 structure that augments an individual to the strength of ten. 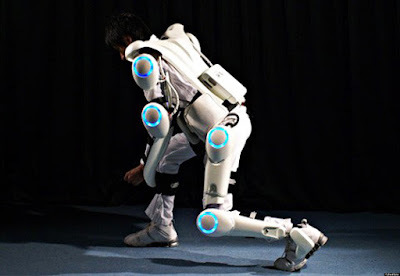 Cyberdyne also claim the name is purely a co-incidental and any reference to Skynet, utterly unintended. Probably best. But the whole HAL pod-bay door may now be slowly opening. Over to you ASIMO.